I just finished watching the fourth episode of the new television show Bates Motel on A&E and came to a realization — this is one of the most genuinely surprising television shows I’ve ever seen. And I love it. By surprising, I don’t mean shocking. I think it’s an important distinction to make. Plenty of shows have shocking moments — moments you don’t see coming, or moments that are meant to throw you for a loop. Scandal, for instance, another show that I love, has lots of shockers — plenty of, “Oh my God, did that really just happen?” moments. Homeland, another great drama, has loads of them as well — some that test the boundaries of credibility, but make your jaw drop nonetheless. But Bates Motel is a different beast. Every moment feels like a surprise to me, because I spend literally the entire episode having no idea what is going to happen next. Despite the fact that it is an origin story based on an iconic film character, there appear to be no rules whatsoever, so anything goes. In some ways that is antithetical to the basic rules of television, which promotes familiarity. Television is the most intimate of mediums, one that we experience in our homes, sitting on our couches or lying in our beds, watching either with friends and family or by ourselves. We watch a show each week and believe we come to know the characters, to understand their motivations, what drives them, and what their actions will be. Because I’ve watched a lot of television in my life, I tend to take for granted this lens of familiarity through which I view drama series. Perhaps that is why I am getting such a rush out of Bates Motel, which is not operating in any template and not adhering to any formula. It feels thrilling. It’s thrilling in the genuinely creepy moments, where we can’t figure out the intentions of certain characters, or we get glimpses into how Norman’s psychosis may emerge. But it’s also thrilling in the quiet moments, like the scene in the episode I just watched where Norman went from sharing the details of Keith’s death with his brother Dylan to getting his advice on going over to a girl’s house. The drama on Bates Motel is not loud, but in its surprises, it has major impact. From the writing to the directing to the cinematography, everything about the show feels like it is teetering on the edge. But nothing feels more dangerous than the acting. 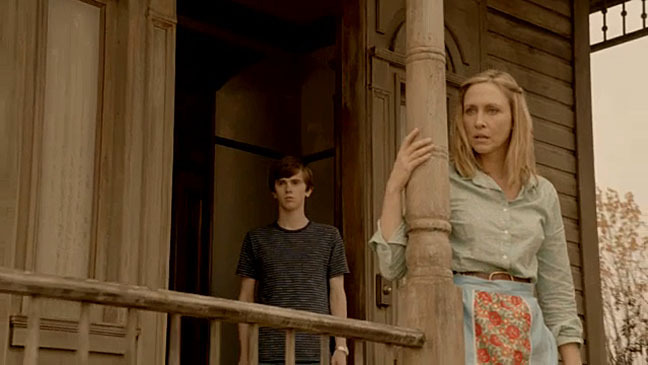 The choices that Freddie Highmore, as Norman Bates, and especially Vera Farmiga, as his mother Norma Bates, are so nuanced, layered and unexpected, they mesmerize. They make it impossible to characterize these complicated characters, whose fates we know all too well, as anything but real human beings. If they both are not rewarded for their work when the Emmy nominations are announced it will be a crying shame. Hell, even the somewhat confounding decision to cast two actors who look eerily alike, Max Thierot and Mike Vogel as Norma’s son Dylan and Detective Zack Shelby, respectively, has surprising ramifications. In a scene in the episode I just finished, Detective Shelby was running his hand up Norma’s leg, and I actually reeled back, thinking, at first, it was Dylan. In a show where incestuous undertones are omnipresent, this moment had unexpected impact. As I said, I’m only about halfway through the season, so I have many more surprising moments ahead of me to look forward to. I can’t wait. This entry was posted in Television and tagged Bates Motel, Freddie Highmore, Max Thierot, Mike Vogel, Television, Vera Farmiga. Bookmark the permalink. As I texted to you last week, and you failed to reply (yes, I’m calling you out on your own blog), I feel like Vera is serving up a modern camp classic here. I feel like there is a little wink accompanying all of Norma’s hysterical breakdowns. Very Mommie Dearest / Bette Davis. There have been some really nice moments on this show – like you mentioned, I loved the scene where the older brother advises Norman to go over the girl’s house. Also, when’s the last time we’ve seen a tastefully shot (or otherwise) floating-in-the-sheets-and-losing-your-virginity montage? I’m guessing circa Dawson’s Creek. I enjoyed the moment where Norman is walking home after that and cracks one huge smile before buttoning up again. I also loved how he left that horrifically long and awkward voicemail for her but didn’t seem mortified about – I think that the only awkward voicemail that’s ever been left on a television show where the character didn’t go “stupid! Stupid” while hitting themselves in the head. Finally, I appreciated the scene where the brothers were riding the motorcycle. I love their burgeoning relationship. JB out. I feel sufficiently called out! I agree, there is definite delicious camp in Vera’s performance, but it’s grounded in enough reality to give it emotional heft. She’s actually moving. That bedroom/floating sheets montage was amazing — visually out of nowhere, but still somehow totally appropriate. I think I must be one episode behind you because I haven’t seen the things you mention in the 2nd half of your comment, but I’ll keep an eye out. As I wrote, I’m totally loving this show.